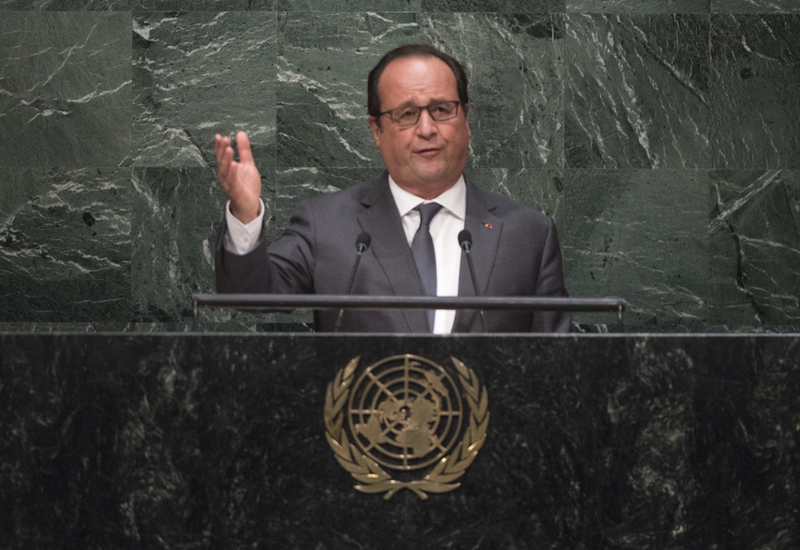 FRANÇOIS HOLLANDE, President of France, said that immense progress had been made since the establishment of the United Nations. However the world still experienced tragedies, dramas and wars. There were hundreds of thousands of refugees, terrorism from which no country was safe and conflicts that had been unresolved for years and which could disintegrate at any moment. Enumerating many natural disasters caused by climate change, he said the upcoming Climate Change Conference in Paris must answer the question: “Is humankind capable of deciding to preserve life on the planet?” Otherwise, it would be too late. He noted some progress, singling out recent commitments made by the United States and China. He favoured a global climate agreement, differentiating the responsibilities of each country. There were three conditions for success in Paris: every country must make commitments on emission reductions; a review mechanism must be established which allowed for revisions every five years; and developed countries should fulfil their commitments to developing countries by ensuring $100 billion in support. France would increase its annual funding for climate from €3 billion to €5 billion to be disbursed, not as loans, but as grants. If a universal agreement emerged with funding and new technology for the future, it could be said that “we rose to the challenge of the future”. Turning to the situation in Syria, he laid the blame for the conflict on Bashar al-Assad, a dictator who bombed his own people. Over the course of three years, an enormous number of refugees had fled the Assad regime. The current Syrian refugee crisis stemmed from the actions of the current regime as well as those of terrorists. A broad coalition was needed to resolve the issue through diplomacy, based on the Geneva II Conference, with a transitional government that included all opposition groups, he said, but excluded Bashar al-Assad, as he was the cause of the conflict. With 80 per cent of Syrian refugees fleeing to other countries of the global South, it was the poor and most vulnerable who were hosting the poor and most vulnerable, he said. The right of asylum united European countries, which should do more. UNHCR and the WFP must be provided the means to ensure the necessary support, and refugees must be allowed to work in their host countries. France was contributing €100 million to the WFP for refugees in countries neighbouring Syria. In closing, he said: “We have to make sure that our future is worthy of what the founding fathers imagined.” He expressed support for expanding the Security Council and for limiting the use of the veto when dealing with cases of mass atrocity. France had made that commitment for itself. The right to veto was not intended as a right to block. What was needed was the ability to act.